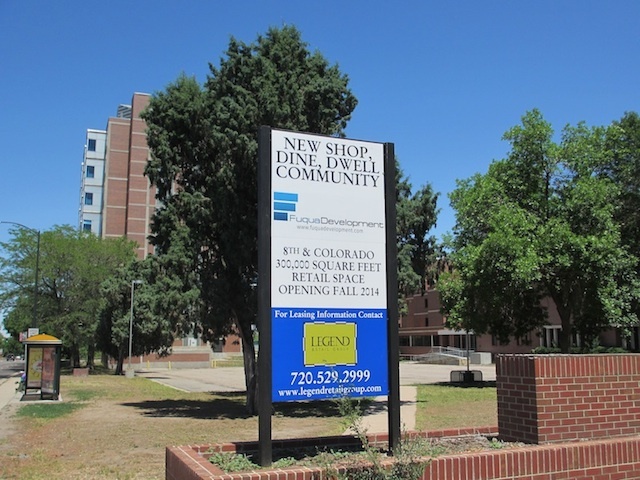 There’s been some big news and some big controversy since last reporting on this very interesting Denver infill project (for the whole series of reports and opinions go here). First, the developer Jeff Fuqua broke away from Sembler and started his own company, Fuqua Development, taking several Sembler personnel with him. The Denver Post and Denver Business Journal have the story. Second, the California specialty grocery store chain Trader Joe’s announced that it intends to purchase a property at the corner of 8th and Colorado, just across the street from the development site chronicled here. This will be the first Trader Joe’s store in Denver. The Denver Business Journal has the story. Trader Joe’s impending arrival has been hailed as good news by everyone I’ve heard comment on it. Walmart’s reputation for questionable business ethics and practices. Exacerbation of traffic problems on Colorado Boulevard, which is already functioning at full capacity. The exchanges around these concerns were generally respectful, but the public outrage was palpable. Fuqua and Walmart representatives did their best to address them. Although Walmart was not in the early discussion of Big Box possibilities, Jeff Fuqua noted that at the end of the day it was the only big box retailer willing to comply with significant General Development Plan constraints and costs. 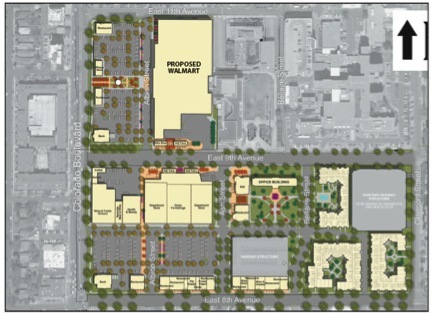 And, that development of the site as a whole depended on anchoring it with a big box store like a Walmart. 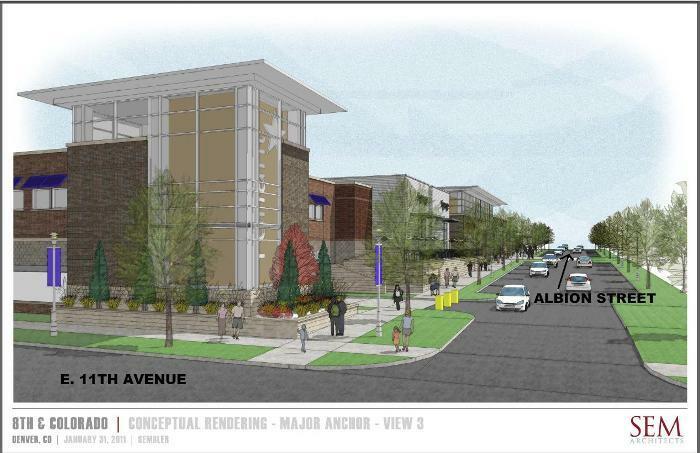 He also noted that Sembler/Fuqua developments have increased property values wherever they appear and that there’s no reason to believe that things would be different at 9th and Colorado. The Walmart representative was armed with talking points to counteract the widespread public perception that Walmart is a particularly ruthless corporate predator that leaves human devastation in its wake. The traffic concern is also widespread and will require a separate public meeting. However, I couldn’t help but note a bit of citizen hypocrisy on this point. The traffic load on Colorado Boulevard is a real and compelling concern. But interestingly there was no mention of the very strong likelihood that Trader Joe’s—whose presence seemed to be unanimously welcomed by the assembled citizens—will attract significantly more people and cars to the neighborhood than a Walmart or any other retailer at 9th and Colorado (a debate is here). The Trader Joe’s customer base is likely to come not only from the greater Denver metro area but also from a good bit of eastern Colorado and western Kansas. Is there a double standard at work here? I’m interested in this development because it’s near my house and I drive past it often. Thus, I’ll patronize it. As previously expressed on this blog it would be nice to see an infill development that breaks the architectural mold (e.g., see here and here), but I don’t have a dog in the hunt. 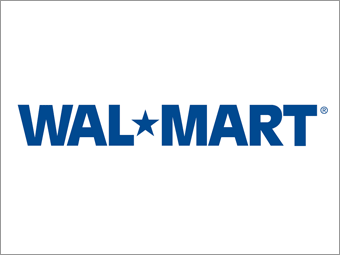 I don’t like what I know about Walmart’s business practices and I consciously avoid the place. At the same time, the Walmart representative acquitted himself very nicely in front of a very hostile audience. I found myself keeping an open mind about the company’s intentions to adopt a position of “co-tenancy” with other retailers and to stock higher-end merchandise that would serve some local desires. The comment about the kind of human “element” that Walmart attracts is of particular interest to us urban anthropologists. This was the rhetorical flourish that provoked the most interesting exchanges of the meeting. One attendee pointedly asked what “element” meant. Are we talking code for black and brown people? That suggestion was vigorously shouted down. One respondent suggested that “element” simply refers to the kind of person who would shoot a Denver police officer. These were awkward moments. Only much later in the meeting did one speaker lecture the crowd to avoid “elitism” and stay focused on Walmart’s business practices. This was good advice, especially given the institutional setting: Christ Church United Methodist is committed, among other things, to “cultural inclusiveness.” But the damage had been done. The demography of the crowd was striking. It was overwhelmingly white (say, 95%) and, by all indications, well-heeled. This picture is consistent with the Hilltop neighborhood located just to the south of the development site which, according to Piton Foundation census data (which I cross-checked against other sources of census data), is 85% white with an average household income of $117,835. The Hale neighborhood located just to the north, however, is nearly 30% non-white, with an average household income of $54,830 (a bit below the overall Denver average of $55,129). About three times as many individuals and families live in poverty in Hale as compared to Hilltop. Thus, Jeff Fuqua has a point when he suggests that the public meeting drew a particular segment of the local population. The local census data lend credibility to Fuqua’s claim, reported in The Denver Post, that his pro/con emails are running “about 50/50.” The data also suggest that there’s a demographic–both white and non-white–in the immediate area that would welcome and sustain a Walmart. It’s also important to keep in mind that public meetings of the sort held this week are probably not the kind that would attract strong minority participation. Thus, it’s imperative that the developers and planners set up meetings in other venues and in other forms by which citizen input from a broad cross-section of neighbors can be solicited. Harvey goes on to suggest that the rhetoric of community and its associated “place-based civic pride and consciousness” serves those who don’t really need it, while those who do are abandoned to their “underclass” fate. Harvey’s analysis might be a little over-the-top for the conversation about what should happen at 9th and Colorado. But then again it might be spot-on, given (1) comments made at the public meeting about the kind of person who shops at Walmart, (2) the tacit assumption of many citizens who spoke at the meeting that they spoke for the community, as if community is a singular thing, and (3) the expressed desire by some in the crowd that they’d like to see 9th and Colorado become another Cherry Creek. 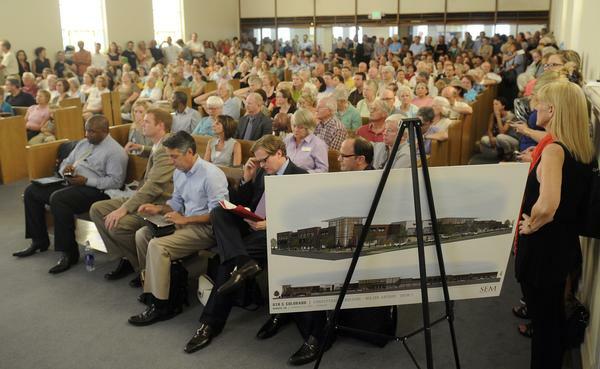 Only a couple of citizens at the public meeting invoked the spirit of compromise that’s required to get anything done these days, including the task of replacing a decrepit and rapidly decaying hospital campus with an active public place. Indeed, writing at the same time as Harvey the great American pragmatist philosopher Richard Rorty suggested in his Achieving Our Country that adherence to fixed principles can, at times, be as much a problem as philosophical wishy-washiness. He notes that in democratic societies “you often get things done by compromising principles in order to form alliances with groups about whom you have grave doubts.” Compromise might in fact be the most appropriate spirit to carry forward if the multiple communities that have a stake in what happens at 9th and Colorado are to be served.